We think there's nothing more "authentic-looking" than a fully restored classic car that's sporting license plates from the year of its manufacture. They make the car look more original (roadworthy, if you will) than those "antique vehicle" or "historic vehicle" tags seen on so many old cars. Frankly, we think the antique plates look a bit depressing. 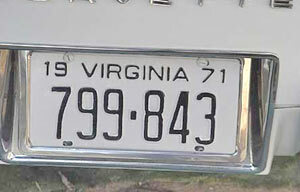 Most states now allow the use of original license plates (vintage license plates) on collector cars. That is, if the owner can find a set of plates issued for the year of manufacture of his car, there is provision within the law to register those plates to the car. Most states legislate their use under their antique vehicle licensing regulations, so if you wish to use "vintage" plates, check with your DMV. Tip: Don't call the DMV office. Go there and, if the person at the desk gives you the "deer in the headlights" look, ask to see a supervisor. Many DMV customer assistants aren't aware of the relatively obscure vintage tag rules. Fortunately, doing all the DMV research and paperwork is the hardest part of restoring license plates. The next-hardest thing is finding the license plates themselves, but we can pretty much guarantee that you'll be able to pick up a set at most any local car show or flea market. License plates dating back to the early '60s typically cost about $25. Earlier plates run about $10 more per decade until you get back into the 20s and 30s. These can get pricey, since they weren't made with very high quality metal and most were melted down during WWII. Turn-of-the-century plates are very valuable and many were made from leather, metal-on-metal and even porcelain. In the best case the plates you find will be in pristine condition and never issued, perhaps still in their original DMV envelope. In the worst case the plates will be bent, rusted and barely usable (This should only be true for very old plates. Otherwise, keep looking). In any case, restoring them is relatively easy, as long as the embossed numbers are still recognizable. The plates need to be cleaned and stripped of old paint, rust, etc. In most cases ordinary paint stripper will work very well, and that's what we did here. 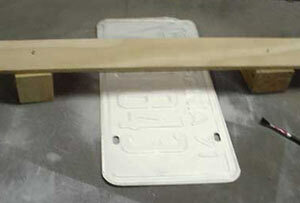 Plates were made with very little paint, so this task is generally quite easy. Sand blasting will work, of course, but remember that license plates were only designed to last a year or so and were made of thin metal. It's easy to blast, sand or otherwise go through the metal if you're not careful. License plate after paint remover was allowed to do its work. This photo shows half of the old paint wiped off. After our plate was stripped to bare metal, we had to straighten out our bend and remove the crease. This is called "forming" in the metalworking and engineering trades, but we call it what it really is: bending! We find the most effective tool to get a license plate [mostly] flat is the hand. Since the metal is so thin it's easy to bend it back with fingers to something resembling straightness. An advantage of doing it this way is that you can't do more harm.Use a set of pliers to "tidy-up" the edges of the plate. Once the plate was flat we could attack the crease. This was done using a small hammer and a flat piece of thick metal underneath. Gentle tapping and patience rendered a pretty nice-looking repair to the crease, and small imperfections could be smoothed out with body filler. It's metal, and it's bare, so the first thing to do is apply a good etching primer. Not only does the primer protect the metal and provide a good bonding surface for the paint, but you can see imperfections that you might otherwise not have noticed. We used DuPont automotive etching primer. When it comes to refinishing the plate you have to make a couple "judgement calls." That is, should the plate be refinished in exactly the same colors, materials and in the same degree of gloss? Bear in mind that most police officers are considerably younger than your car and wouldn't remember the color or shine of plates of that era, so as long as the plates look somewhat authentic, why not personalize them a little bit? We think there's a little room here for "artistic license" (pun definitely intended). In our case the plate was originally white with black lettering, both in a low-gloss lacquer finish. We decided to refinish the plate in gloss enamel, for appearance and cleaning reasons. However, the array of colors other states used for their plates is virtually endless, from the oranges and blues of Pennsylvania to the greens, purples and who-knows-what. You should try to approximate the colors, but we highly advise using modern enamels or epoxy paints for a nicer finish. The license plate after a coat of base color. The first thing we did was to apply several coats of background color (in this case, white) to the plate, so it would be ready for lettering. Powder coating the plates would have been an option but we had used a little body filler on the metal. Thatrendered powder coatinga no-no. Now came the hard part, putting black paint on the raised numbers. We researched how the manufacturers originally did this and found that in most cases the painted plates were conveyed under an "inked" (with paint, of course) roller, similar to a printing press. The roller transferred exactly enough paint onto the raised numbers/letters. To be perfectly honest, we've tried re-creating this system, using rubber wallpaper edge rollers and a number of other devices. All have proven messy, unworkable or otherwise have produced an unacceptable finish, not to mention a tedious cleanup. We've always come back to the tried-and-true artist brush approach. It's time-consuming and requires a lot of patience, but how many license plates do you plan to do? The license plate under our bridge, used to steady our hand and keep ut out of the wet paint. We use a small, very high quality artist brush (If it didn't cost at least $3.00 it isn't good enough. Its bristles must be very soft and uniform) and mix our paint with just enough thinner so that the paint won't harden or "skim over" while we're brushing. We set the plate at a comfortable height on the table, under very bright light. We made ourselves a little "bridge" on which to rest our hand and slid the plate underneath. We then wet the brush with as much paint as possible without dripping, then applied the paint along the outside of the raised elements, using a constant motion. We moved the license plate around to keep the direction of stroke comfortable. After the perimeter of a letter/number was done we filled in the center area while the paint was still wet. 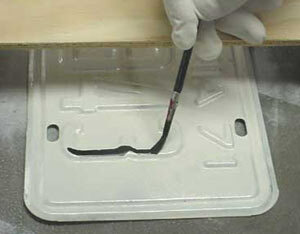 This technique assured that the paint would flow enough to form a smooth, even surface (remember how you used to paint your model cars and planes?). Painting the numbers using the bridge and a slow careful stroke. We found that, depending upon how many numbers/letters there were, only so many could be colored at one sitting. Wecleaned the brush and covered the paint until the first portion was dry, then continued. If we accidentally ran too much paint down onto the white surface we simply came back after the paint dried and painted over the "mistake" with white. When examined very closely, numbers/letters painted this way will look imperfect. Very few people have steady enough hands to produce a perfect line, so the edges will look wavy. Not to worry, however, because from a few feet away the license plates look every bit as "manufactured" as the originals did. The gloss enamel finish is much more attractive and resistant to weather and exhaust fumes. The finished license plate on the car.